First place goes to Badger’s Lavender and Orange Lip Balm. The lavender is subtle but if it’s not your thing there’s a flavour for every palette (I’m going to order Vanilla Madagascar next). 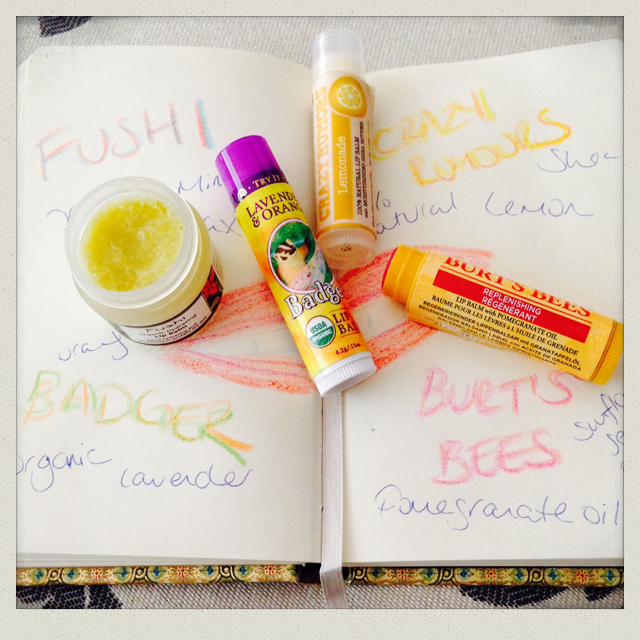 The lip balm is teaming with different oils (from rosehip to seabuckthorn), very hydrating and goes on easily. But Badger mainly burrows its way to the top as it’s 100% organic too. I bought mine from Beauty Naturals for £2.50. Fushi Organic Hydrating Lip Balm is my second place choice. I love this one but it loses out on the top spot as it’s in a pot and the priciest of those I reviewed (£5.15 from Ocado). But it’s rich and the peppermint essential oil gives your pout a refreshing tingle! In third is Crazy Rumors which is £3.50 from Holland & Barrett. It’s deliciously lemony (if you couldn’t guess from the name) and really moisturising. The two main ingredients, macadamia and olive oil, are organic but the rest aren’t. Worth checking out for the range of scrummy sounding flavours such as amaretto, gingerbread and apple spice. Finally, a disappointing fourth place for Burt’s Bees. This lip balm doesn’t feel quite as rich as the others and it didn’t go on as easily. It also has a slight soapy taste which put me off. Available from Holland & Barrett for £3.69. If you’re feeling frugal this January I highly recommend decanting some of Waitrose’s Baby Bottom Butter into a small pot and using this instead.